Early exposure to Yosemite as a young child ignited a life-long love of the Park and its grandeur in artist Leif Trygg of Oak Leaf Studio. 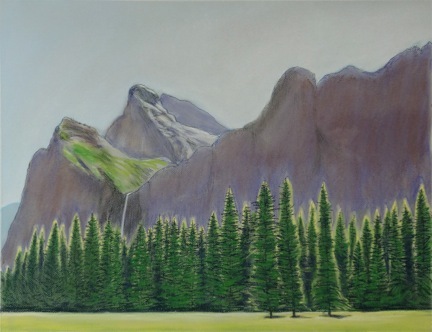 In celebration of the National Park Service’s 100th anniversary this year, Oak Leaf Studio, located at 247 Oak Street between Hanson Howard and Ashland Artworks, will feature large pastel paintings of Yosemite’s landmark scenery. Included in the show is a new picture of Bridalveil Fall, shown here as a work-in-progress. We encourage you to visit the Studio to see the finished piece as well as other magnificent landscapes of this iconic Park.